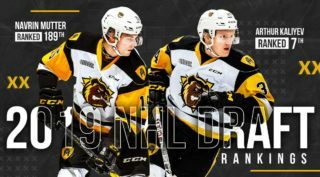 The Hamilton Bulldogs are OHL East Division champions for the first time, stringing together their sixth straight win on Saturday to capture the division title on home ice. 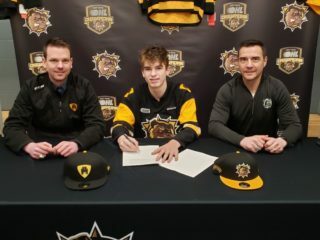 Overage veteran Ryan Moore scored twice while Ben Gleason, Robert Thomas and Will Bitten each had two assists as the Bulldogs skated past the Oshawa Generals 4-1 to improve to 41-16-3-3. 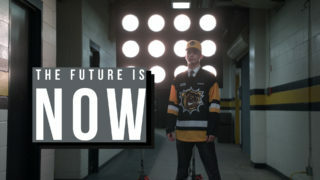 @BulldogsOHL clinch OHL’s East Division Championship. The Bulldogs are awarded the Leyden Trophy as East Division Champions, a trophy first presented in 1975-76 when the OHL was split into divisions with the expansion of the League to 12 teams. The award originated in recognition of former long-time Oshawa Generals general manager Matt Leyden for his contributions to junior hockey in Ontario. Prior to their move to Hamilton to begin the 2015-16 season, the Belleville Bulls had won the East six different times with the most recent title coming in 2012-13. The city of Hamilton’s last division title came back in 1976 when the OHL champion Hamilton Fincups claimed the Emms Trophy. A team led by 139-point scorer Dale McCourt, the Fincups went on to win the 1976 Mastercard Memorial Cup in Montreal under head coach Bert Templeton. A veteran-laden Bulldogs squad features considerable offensive depth led by 35-goal scorers Matthew Strome and Brandon Saigeon. Mid-season acquisitions in Moore, Nicholas Caamano, Robert Thomas and Riley Stillman have only strengthened a pre-existing core that includes veteran Will Bitten, captain Justin Lemcke, Arizona Coyotes prospect MacKenzie Entwistle and rookie standout Arthur Kaliyev. 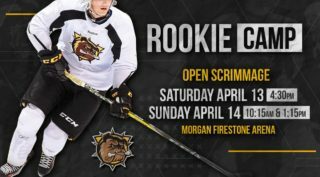 While the Bulldogs have set a new benchmark in Steeltown this season, they continue to keep their eyes on the prize as they look to hoist the J. Ross Robertson Cup and the Memorial Cup for the first time this spring.